Boy it sure has been a long time right? There has been a lot going on with the app recently. First, we’ve reached over 2000 movies in the database! 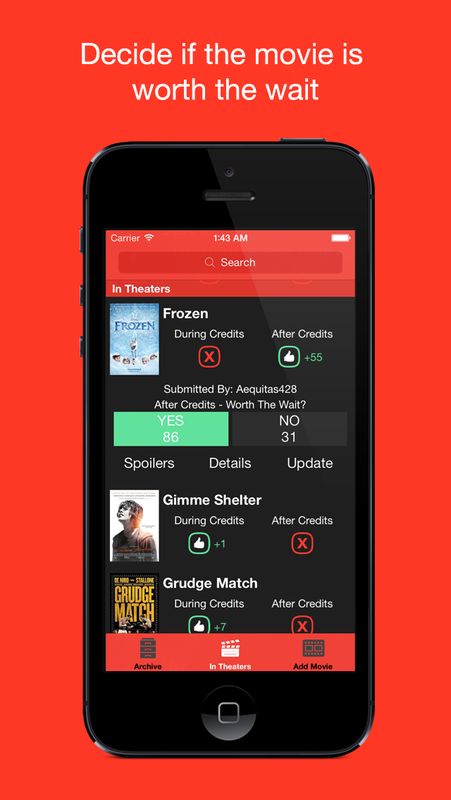 It is very much thanks to Jamie Summers who has submitted over 900 movies! I really appreciate all the contributions that everyone has done and would love to keep this up! Second and most important is the new version 4.0 update! The pictures at the top is a preview of what the app will look like. I will explain more in the paragraphs below. In summary, the app is rebuilt from ground up and is redesigned to match iOS 7 design changes. It was needing a refresh and I was glad to have the time to do so. The old project before I worked on this update was a real mess. I started this project when I was still learning about creating apps so I threw in anything I thought would be cool to have. As you can tell, it got packed in with lots of different features by the end. There were a lot of inconsistencies both in the code and on the visual side. The voting view with the weird thumbs up and thumbs down didn’t match the smiley faces. The loading indicator’s color did not match any of the apps. There was no way of knowing what each button did unless you tap on it. Now that I had more time to work on it and I’ve gain experience making apps over the years, I felt that it was time for me to completely rebuild the app. The very first thing I decided to do was to keep it simple. Use a bottom tab bar for navigating between the three views. Search bar is the only on the top for all three views. Keep it down to less than 5 colors (gray, white, green, red) to keep everything consistent. One other big change is that you’ll notice there are no more smiley faces. That was one of the first thing I wanted to remove on the this refresh design. It has been replaced with thumbs up, thumbs down, red X, and white question mark. It’s very simple to get once you do get it. I even included a tutorial (more on that later) to explain it further. Basically, the plus (thumbs up) or minus (thumbs down) is determined by the difference between the amount of user who says the clip was worth the wait and the amount of users who says the clip was not worth the wait. If it is a positive then it’s a thumbs up. Negative = thumbs down. Both the thumbs up and down mean that there is a clip of course. The crossed out X means no clip available. The voting/spoilers option will also appear only when there is a clip available. If not, it will not even display it. This should take away the confusions that users may have with the voting system. You may also not notice the new spoiler and description view but it is also completely redone. It should be a lot of smoother and without any animations (popping animation) that would get in the way. Voting and loading movies from the archives are also much faster due to the more streamlined code that I’ve written. A lot of the animations will also be smoother as well so no more stuttering or hackery going on to make things work. 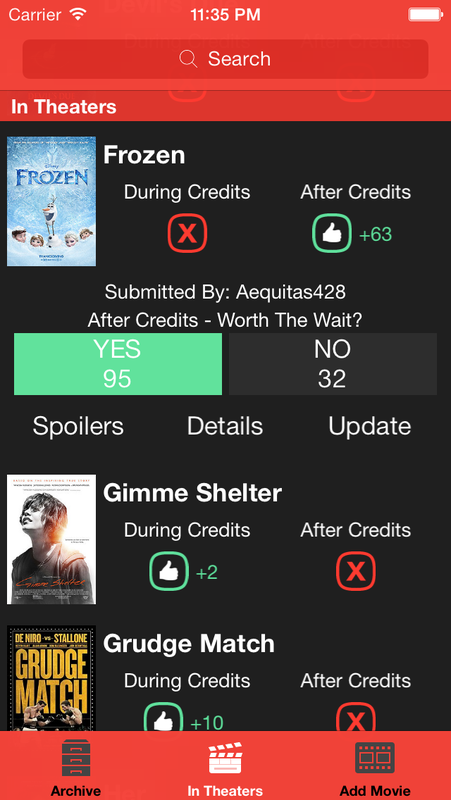 I’ve added the feature to search for the movie that you would like to add. This is one of the steps I had to go through myself after I reviewed a submission. However with this process in user’s hands, I believe this will simplify a lot of things. One of the main big thing was when there would be name conflicts for two movies that came out at different times. 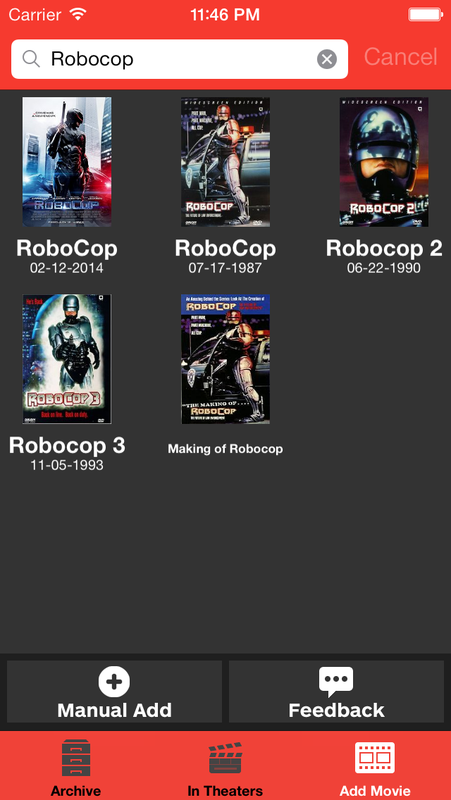 For example, the new Robocop (2014) and the old Robocop (1987). Before there would have been no way of figuring out which movie is what unless the user specified it. 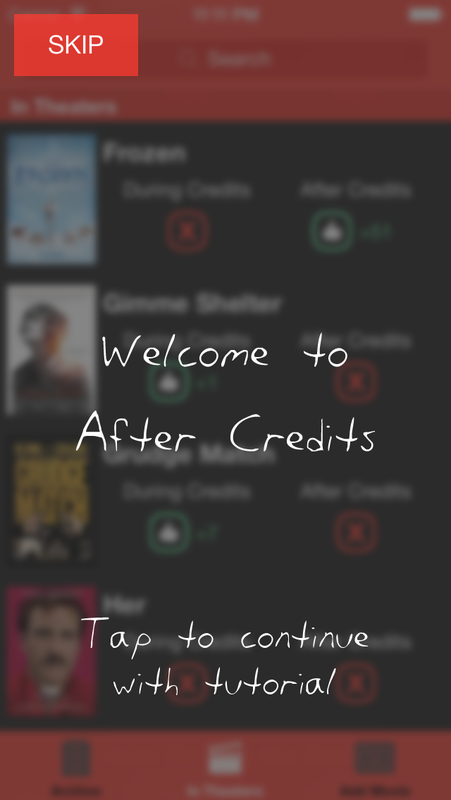 Now it should be much more simple and smoother for the user to add the movies. 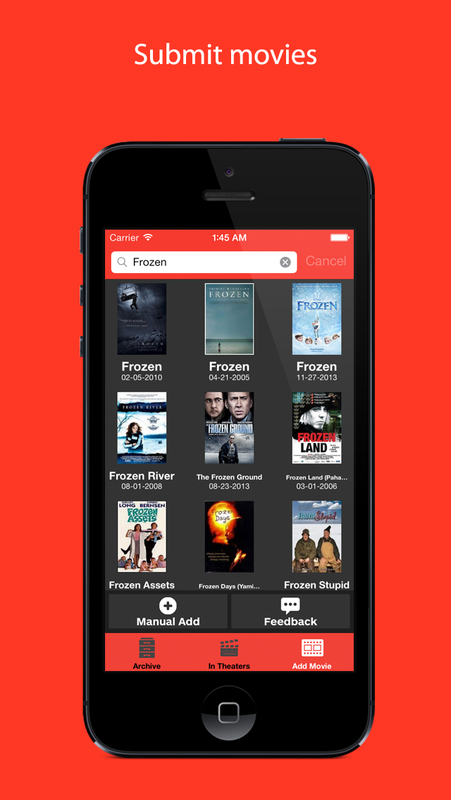 If you feel like using the old way, there’s also an option to add the movies manually without the need for searching them. Let me know what you guys think and what improvements I can work on to make this process a lot better! One of the main things I wanted to do was to add a tutorial in the beginning to explain to the users how the app works. So I’ve added that. It’s pretty straight forward and if you think something is useful, please let me know! Hopefully this will take away any confusions users may have with the voting system and how the pluses and minuses are calculated. One last thing I’ve added is the inclusion of iOS 7’s background refresh on the In Theaters screen. 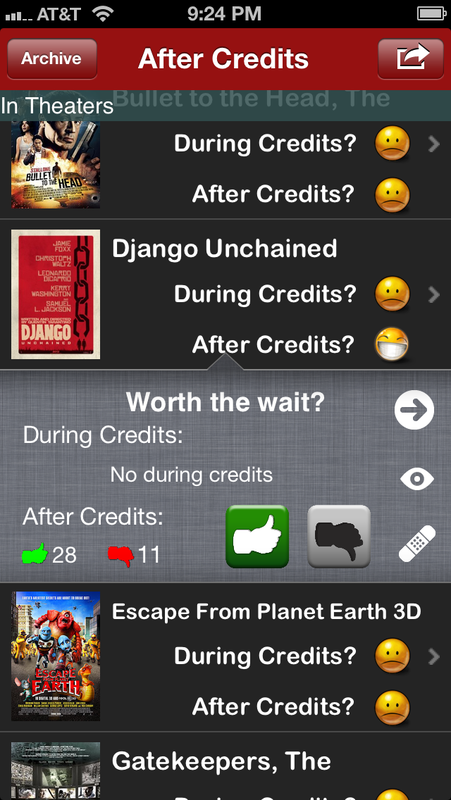 It will allow users to see the most up to date data about the movies. There’s no background refresh in archives or anywhere else so no need to worry there. I’ve set the amount of refresh time to minimal so it shouldn’t refresh that often and plus the data package is so small for the In Theaters screen that you will not need to worry about it sucking up data. So this is just a brief intro to some of the many changes in the new version 4.0. Stuff like the new icons and new color scheme are things that I hope people would like but I figure I wouldn’t need to talk about it. This is going to be a big change for most users and I believe it’s for the better. There’s a lot of improvements to almost everything that I wish I released this as soon as iOS 7 was released. I apologize for the long delay but hoping everyone will enjoy this new update!